Colin Rand Kaepernick (/ˈkæpərnɪk/ KAP-er-nick; born November 3, 1987) is a professional American football quarterback for the San Francisco 49ers of the National Football League (NFL). He played college football at Nevada, and was drafted by the 49ers in the second round of the 2011 NFL Draft. At Nevada, he twice was named the Western Athletic Offensive Player of the Year, and he was the Most Valuable Player of the 2008 Humanitarian Bowl. Beginning his professional career as a backup to Alex Smith, Kaepernick became the 49ers' starter in the middle of the 2012 season when Smith suffered a concussion. He remained the team's starting quarterback for the rest of the season and went on to lead the 49ers to their first Super Bowl appearance since 1994, although the game ended in defeat for the team. Despite posting strong numbers in his first full season as a starter and helping the 49ers reach the NFC Championship for a second consecutive year, Kaepernick's performance began to decline. The 49ers missed the playoffs in 2014 season as Kaepernick's statistics dropped from the previous year and he was benched following persistent struggles during the 2015 season. After beginning the 2016 season as a backup, he resumed his duties as a starter early in the year. In 2016, Kaepernick gained national attention when he began protesting the alleged oppression of black people by not standing while the United States national anthem was being performed before the start of games. His actions prompted a wide variety of responses, including additional athletes in the NFL and other U.S. sports leagues protesting in various ways during the anthem. Kaepernick was born in Milwaukee, Wisconsin, to Heidi (Zabransky) Russo, a 19-year-old white woman who was single and destitute at the time. His birth father, an African American, left the family before he was born. Russo placed her son for adoption with Rick and Teresa Kaepernick, a white couple who had two children—son Kyle and daughter Devon—and were looking for a boy after having lost two other sons to heart defects. Kaepernick became the youngest of their three children. He lived in Fond du Lac, Wisconsin, until age four, and attended grade school in Turlock, California. Kaepernick began playing youth football at 8-years old as a defensive end and punter. He then became his youth team's starting quarterback at age nine, and he completed his first competitive pass for a long touchdown. A 4.0 GPA student at John H. Pitman High School in Turlock, California, Kaepernick played football, basketball and baseball and was nominated for All-State selection in all three sports his senior year. He was the Most Valuable Player (MVP) of the Central California Conference in football, leading his school to its first-ever playoff victory. In basketball, he was a first-team all CCC selection at forward and led his 16th-ranked team to a near upset of the Number 1-ranked Oak Ridge Trojans in the opening round of playoffs. In that game, Kaepernick scored 34 points but Ryan Anderson scored 50 to beat the Pitman Pride. Kaepernick achieved most of his accolades in high school as a baseball pitcher and received several scholarship offers in that sport, yet he desperately wanted to play football in college. He was almost 6' 5" as a senior, but weighed only 170 pounds (77 kg) and his coaches generally kept him from running the ball to limit his risk of injury. He also had poor throwing mechanics, despite his strong arm. During his junior year, Pitman's head coach at the time, Larry Nigro, made a highlight tape which Colin's brother, Kyle, copied to DVD, then sent it to about 100 Football Bowl Subdivision (FBS, then known as Division I-A) programs, receiving some interest but no offers for scholarship. Even as a senior, he received little attention from FBS schools. Although the University of Nevada, Reno coaching staff frequently watched video of his high school team, no one from the Nevada Wolf Pack football staff came to Turlock to see him play during his senior football season. Nevada head coach Chris Ault decided to offer him a scholarship after one of his assistants, Barry Sacks, saw Kaepernick dominate a high school basketball game on an evening he was suffering from a fever of 102 °F (39 °C). Nevada was the only school to offer him a football scholarship, but was concerned that he would opt for baseball until he signed in February 2006. He was a two-time California all-state baseball player and was listed as a draftable prospect on Major League Baseball's website in the class of 2006. He earned Northern California athlete of the week honors as a pitcher. He was reported to throw a 92 mph (148 km/h) fastball as a senior in high school, as reported during Kaepernick's first college football start in 2007 against Boise State He was also a member of the Brewers Grey squad in the 2005 Area Code games. During his senior year Kaepernick pitched two no-hitters in high school play. He also turned down numerous scholarship offers to play baseball at many notable NCAA programs, instead taking his lone football scholarship offer to play quarterback at Nevada.. In his senior year of high school Kaepernick had an ERA of 1.265 with 13 starts and 10 complete games. He finished the year with an 11–2 record with 97 strikeouts and 39 walks. 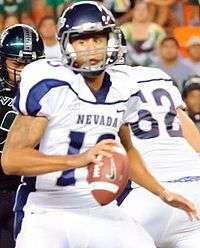 Kaepernick started his college career at Nevada playing in 11 of the team's 13 games. He finished the season with 19 passing touchdowns, 3 interceptions, 2175 passing yards with a 53.8% completion percentage. Kaepernick also added 593 rushing yards and 6 rushing touchdowns as the Nevada Wolf Pack finished 6-7. Ranked second among all NCAA QB's in rushing yardage with 1,130. Ranked seventh among all NCAA players with 7.02 yards per carry. Was tied ninth among all NCAA players with 17 rushing TD's. Despite playing the entire second half with an ankle injury, he set a new Humanitarian Bowl record with 370 yards passing and was awarded the MVP in a losing effort. He was named the WAC Offensive Player of the Year at the end of the season. He was the first sophomore to win this award since Marshall Faulk of San Diego State did in 1992. He was also named first team All-WAC quarterback. He was the first sophomore to win this award since Trent Dilfer of Fresno State, also in 1992. Kaepernick was named the pre-season WAC Offensive Player of the Year at the WAC Media's event in July. On August 3 it was announced he was named to the Davey O'Brien Award pre-season watch list. On August 14 it was announced that he was named to the pre-season Maxwell Award watch list and on August 17 to the Manning Award watch list. Kaepernick led the Wolf Pack to an 8–5 record and a second-place finish in the WAC behind undefeated Boise State. He was named second team All-WAC quarterback. He is the first player in Nevada history to earn the team's MVP award twice, doing so in 2008 as well. Passing against Hawaii in 2010. Entering the 2010 NCAA season, Kaepernick ranked first among active college football players in rushing touchdowns. He was second in Yards Per Carry (behind Wolf Pack teammate Vai Taua), Total Offense per Game, and Touchdowns Scored. He ranked third in Yards per Play and fourth in pass touchdowns and Total Number of Offensive Plays. Kaepernick was a counselor at the prestigious MPA event in Thibodaux, Louisiana, during the 2010 camp. He had an impressive showing, drawing praise from various NFL and ESPN personnel including former New York Giants quarterback Jesse Palmer who said of Kaepernick, "by far, the strongest arm in the camp". It was also announced that Kaepernick, along with teammates Taua and Lippincott, will have a display in the College Football Hall of Fame commemorating their being the first players in NCAA history to each break 1,000 yards rushing on the same team during the same season. Kaepernick was named to the watch list for six major college football awards: the Manning Award, the Davey O'Brien Award, the Paul Hornung Award, the Maxwell Award, the Unitas Award, and the Walter Camp Award. On November 26, Kaepernick led his team to a 34–31 overtime victory against the previously undefeated Boise State Broncos, snapping a 24-game win streak that had dated back to the 2008 Poinsettia Bowl. This game was played on Nevada's senior night, the final home game for Kaepernick and fellow notable senior running back Vai Taua. Nevada Head Coach Chris Ault would later call this game the "most important win in program history". During this game, Kaepernick surpassed 1,000 rushing yards for this season, becoming the first player in NCAA history to have over 2,000 yards passing and 1,000 yards rushing for three consecutive seasons. Along with Taua's 131 yards rushing in the game, the duo became the NCAA's all-time leaders in rushing yards by teammates (8,285) passing the legendary SMU "Pony Express" duo of Eric Dickerson and Craig James (8,193). On December 4 against Louisiana Tech University, Kaepernick joined Florida's Tim Tebow as the second quarterback in FBS history to throw for 20 touchdowns and run for 20 in the same season. Later that same evening, Auburn's Cam Newton joined Tebow and Kaepernick as the third. Kaepernick's three rushing touchdowns in that game also placed him in a tie with former Nebraska quarterback and Heisman Trophy winner Eric Crouch for most rushing touchdowns in FBS history by a quarterback with 59 in his career. Nevada claimed a share of the WAC title after defeating Louisiana Tech. Kaeperick was named WAC Co-Offensive Player of the Year with Kellen Moore, who won the award in 2009. Upon graduation, Kaepernick signed with XAM Sports and Entertainment. He spent time in Atlanta, Georgia, training for the NFL Combine at Competitive Edge Sports with trainer Chip Smith and quarterbacks coach Roger Theder. For the 2011 preseason, Kaepernick completed 24-of-50 passes for 257 yards and 5 interceptions. Kaepernick spent the 2011 season as backup to Alex Smith and played his first game in Week 4 (October 2) on the road against the Philadelphia Eagles. On third down and 17 during the first quarter, Kaepernick came in for Smith as quarterback with the offense in shotgun formation and handed off to Frank Gore, who ran for five yards. In the Week 5 (October 9) home game, a 48–3 win over the Tampa Bay Buccaneers, Kaepernick completed three passes for 35 yards. However, Kaepernick failed to complete two passes in the 49ers' Week 13 (December 4) game, a 26–0 win over the St. Louis Rams. The 49ers finished the 2011 regular season 13–3 but lost the NFC championship to the eventual Super Bowl champion New York Giants. In 2012 against the New York Jets, Kaepernick scored his first career touchdown on a seven-yard run. Throughout the early season, Kaepernick was used as a wildcat quarterback. In Week 10 against the St. Louis Rams, Kaepernick replaced starter Alex Smith, who had suffered a concussion in the first half. However, the game would end in a rare 24–24 tie, the first tie in the NFL in four years. With Smith still recovering, Kaepernick got his first NFL start the next game on November 19, during a Monday Night Football game against the Chicago Bears at Candlestick Park. Kaepernick completed 16-of-23 for 246 yards with two touchdowns and no interceptions in a 32–7 win against a highly ranked Bears defense. 49ers head coach Jim Harbaugh spoke highly of Kaepernick's performance after the game, leaving open the possibility of Kaepernick continuing to start. "Usually tend to go with the guy who's got the hot hand, and we've got two quarterbacks that have got a hot hand", Harbaugh said. A quarterback controversy began. Smith was ranked third in the NFL in passer rating (104.1), led the league in completion percentage (70%), and had been 19–5–1 as a starter under Harbaugh, while Kaepernick was considered more dynamic with his scrambling ability and arm strength. Smith was cleared to play the day before the following game, but Harbaugh chose not to rush him back and again started Kaepernick. 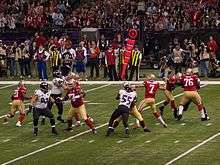 In a rematch of the 2012 playoffs against New Orleans, the 49ers won 31–21 with Kaepernick throwing for a touchdown and running for another. The following week, Harbaugh announced that Kaepernick would start for the 8–2–1 49ers against St. Louis. Harbaugh stated that Kaepernick's assignment was week-to-week, not necessarily permanent, but he remained the starter for the rest of the season. In his first career postseason start, the 49ers won 45–31 against the Green Bay Packers, and he set an NFL single-game record for most rushing yards by a quarterback with 181, breaking Michael Vick's record of 173 in a 2002 regular season game. He also broke the 49ers postseason rushing record, regardless of position. Kaepernick carried the ball 16 times for 181 yards and scrambled five times for 75 yards, including touchdowns of 20 and 56 yards, and collected another 99 yards rushing on zone-read option plays. He also passed for 263 yards and two touchdowns. In total, Kaepernick had 444 yards of total offense with 4 TDs. Kaepernick became the third player after Jay Cutler in 2011 and Otto Graham in both 1954 and 1955 to run for two touchdowns and pass for two others in a playoff game. In the NFC Championship game, the 49ers defeated the Atlanta Falcons 28–24 with Kaepernick completing 16 out of 21 passes for 233 yards and one touchdown. The team advanced to Super Bowl XLVII in New Orleans against the Baltimore Ravens. Kaepernick threw for a touchdown and ran for another, but the 49ers fell behind early and could not come back, losing 31–34. In the season opener of the 2013 season against the Green Bay Packers, Kaepernick threw for a career-high 412 yards and three touchdowns, the first 400-yard game by a 49ers quarterback since Tim Rattay on October 10, 2004. Of the total 412 yards, 208 yards were to newly acquired teammate Anquan Boldin, making his debut as a 49er. In addition, Kaepernick's performance also marked the first 400-yard passing with three touchdowns performance by a 49ers quarterback since Jeff Garcia in the 1999 season. In the NFC Championship Game against eventual Super Bowl champion Seattle Seahawks, Kaepernick rushed for 130 yards, including a 58-yard run, and passed for 153 yards. The 49ers led until the fourth quarter. Two turnovers by Kaepernick led to the Seahawks having a 23–17 lead with a few minutes left. Kaepernick drove the 49ers to the red zone but with 22 seconds left, Kaepernick's pass intended for Michael Crabtree was tipped by Seattle's Richard Sherman and intercepted by Malcolm Smith, ending the 49ers' season. Kaepernick ended the season with 3,197 yards passing, 21 touchdowns, and only eight interceptions. He also finished with 524 yards rushing yards and four rushing touchdowns. On September 17, Kaepernick was fined by the NFL for using inappropriate language on the field. On October 9, Kaepernick was fined $10,000 by the NFL for appearing at a post-game press conference wearing headphones from Beats by Dre, while the league's headphone sponsor was Bose. In a game against the San Diego Chargers, Kaepernick recorded a 90-yard run for a touchdown. The 49ers finished the season 8–8 and failed to make the playoffs for the first time since 2010. Kaepernick threw for 3,369 yards with 18 touchdowns and 10 interceptions. He rushed for 639 yards and one touchdown. Following the season, head coach Jim Harbaugh left to coach the University of Michigan. Kaepernick struggled under new head coach Jim Tomsula. A day after a 27–6 collapse at St. Louis in Week 8, Kaepernick lost his starting job to backup Blaine Gabbert for Week 9 against Atlanta. With Gabbert starting as their new quarterback, the 49ers narrowly won 17–16. On November 21, the 49ers announced that Kaepernick would miss the rest of the season because of an injured left shoulder that required surgery. He finished the season with 1,615 yards passing, six passing touchdowns, five interceptions and 256 rushing yards with one rushing touchdown. Kaepernick entered the 2016 season competing for starting quarterback position with Gabbert. On September 3, 2016, Kelly named Gabbert as the starter for the beginning of the 2016 NFL season with Kaepernick as his backup. Prior to the 49ers Week 6 game against the Buffalo Bills, Kelly announced Kaepernick would start, marking his first start of the season. On October 13, it was announced that Kaepernick and the 49ers restructured his contract, turning it into a two-year deal with a player option for the next season. He completed 13-of-29 passes, with 187 passing yards, one passing touchdown and 66 rushing yards in the 49ers 45-16 loss to the Buffalo Bills. On November 27, Kaepernick recorded 296 passing yards, three passing touchdowns and 113 yards rushing in the 49ers' 24-31 loss to the Miami Dolphins. Kaepernick joined Michael Vick, Cam Newton, Randall Cunningham, and Marcus Mariota as the only quarterbacks in NFL history to record at least three passing touchdowns and 100 yards rushing in a game. 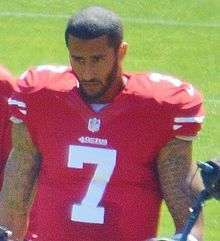 Before a preseason game in 2016, Kaepernick sat down, as opposed to the tradition of standing, during the playing of "The Star-Spangled Banner". During a post-game interview he explained his position stating, "I am not going to stand up to show pride in a flag for a country that oppresses black people and people of color. To me, this is bigger than football and it would be selfish on my part to look the other way. There are bodies in the street and people getting paid leave and getting away with murder", referencing a series of events that led to the Black Lives Matter movement and adding that he would continue to protest until he feels like "[the American flag] represents what it's supposed to represent". The 49ers released a statement respecting Kaepernick's right to protest. In the 49ers' final 2016 preseason game on September 1, 2016, Kaepernick opted to kneel during the U.S. national anthem rather than sit as he did in their previous games. He explained his decision to switch was an attempt to show more respect to former and current U.S. military members while still protesting during the anthem after having a conversation with former NFL player and U.S. military veteran Nate Boyer. Some U.S. military veterans voiced support using the social media hashtag "veterans for Kaepernick". In the following weeks, Kaepernick's jersey became the top-selling jersey on the NFL's official shop website. The September 2016 police shootings of Terence Crutcher and Keith Lamont Scott have also bolstered support for his protest and silenced some critics. Kaepernick said of the Terence Crutcher shooting, "this is a perfect example of what this is about." Kaepernick also received public backlash for his protest. A few NFL fans posted videos of them burning Kaepernick jerseys. Former NFL MVP Boomer Esiason called Kaepernick's actions "an embarrassment" while an anonymous NFL executive called Kaepernick "a traitor". He also claims to have received death threats. Kaepernick also drew some public backlash after he chose not to exercise his right to vote during the 2016 United States presidential election between Donald Trump and Hillary Clinton. He explained his position by saying "it really didn't matter who [became president], the system still remains intact that oppresses people of color." Kaepernick was baptized Methodist, confirmed Lutheran, and attended a Baptist church during his college years. Kaepernick spoke about his faith saying, "My faith is the basis from where my game comes from. I've been very blessed to have the talent to play the game that I do and be successful at it. I think God guides me through every day and helps me take the right steps and has helped me to get to where I’m at. When I step on the field, I always say a prayer, say I am thankful to be able to wake up that morning and go out there and try to glorify the Lord with what I do on the field. I think if you go out and try to do that, no matter what you do on the field, you can be happy about what you did." When he was 10 years old, Kaepernick acquired a pet tortoise named Sammy. The tortoise since has grown to weigh 115 pounds. When he was in 4th grade, Kaepernick wrote himself a letter, predicting that he would be 6 feet 4 inches, 190 pounds, and would "then go to the pros and play on the Niners or Packers even if they aren't good in seven years", predictions which became accurate except for his weight. Near the end of the 2012 NFL season, Kaepernick's signature touchdown celebration earned him a photo fad by his namesake, called "Kaepernicking". The signature touchdown pose involves flexing and kissing the bicep of his right arm. Kaepernick says he kisses his "Faith", "To God The Glory", and Psalm 18:39 tattoos and the reason he does the celebration is because "...it's my way of saying I don't really care what people think about my tattoos" and "God has brought me this far. He has laid out a phenomenal path for me. And I can't do anything but thank Him." Kaepernick reportedly started dating radio personality and television host Nessa in July 2015 and officially went public about their relationship in February 2016. ↑ Yorkey, Mike (August 1, 2013). "Playing with Purpose: Football: Inside the Lives and Faith of the NFL's Most Intriguing Personalities". Barbour Publishing – via Google Books. 1 2 Reily, Rick (January 30, 2013). "A call Kaepernick should make". ESPN.com. Archived from the original on February 2, 2013. ↑ Wise, Mike (January 30, 2013). "Super Bowl: Colin Kaepernick isn't out of central casting, but he may become new poster boy". The Washington Post. Archived from the original on February 26, 2013. 1 2 3 4 5 Himmelbach, Adam (August 28, 2010). "Not a Household Name, Not Even in Nevada". The New York Times. Retrieved October 4, 2010. 1 2 3 4 Adelson, Andrea (October 4, 2010). "Colin Kaepernick more than star QB". ESPN.com. Retrieved October 4, 2010. ↑ Hale, Jennifer (May 4, 2014). "Ryan Anderson recalls going up against Colin Kaepernick in high school". FoxSports.com. Archived from the original on August 12, 2015. ↑ "Kaepernick's First Start (part 1)". YouTube. Retrieved October 13, 2012. ↑ "Draft: 2009 DraftTracker". Mlb.mlb.com. June 19, 2012. Retrieved January 22, 2013. ↑ "The story behind the Cubs drafting 49ers quarterback Kaepernick". Csnchicago.com. December 12, 2012. Retrieved January 22, 2013. ↑ 2008 Roady's Humanitarian Bowl Media Guide, Nevada Wolf Pack, University of Nevada Athletic Media Services Office, retrieved January 2, 2009. ↑ "Arming the Pistol – Nevada Wolf Pack Sports and News". Silverandbluesports.com. July 20, 2010. Retrieved October 13, 2012. ↑ Kaepernick profile at nmnathletics.com Archived May 29, 2015, at the Wayback Machine. ↑ "Colin Kaepernick Stats – College Football at Sports-Reference.com". 1 2 3 "Colin Kaepernick game logs 2011". NFL. Retrieved November 19, 2012. ↑ "Kaepernick Draws First Blood with TD in 'Niners Win Over Jets". Kolotv.com. September 30, 2012. Retrieved October 13, 2012. ↑ "Packers preparing for 49ers to use Colin Kaepernick in the Wildcat | ProFootballTalk". Profootballtalk.nbcsports.com. September 7, 2012. Retrieved October 13, 2012. ↑ "49ers, Rams play to NFL's first tie in four years". Retrieved August 30, 2016. ↑ Davis, Nate (November 19, 2012). "49ers' Alex Smith out vs. Bears, Colin Kaepernick to start". USA today. Retrieved November 20, 2012. 1 2 "Colin Kaepernick sets QB rushing mark as Niners oust Packers". ESPN.com. January 12, 2013. Retrieved January 14, 2013. ↑ Inman, Cam (January 12, 2013). "Putting Kaepernick's rushing performance in franchise, league perspective". San Jose Mercury News. Retrieved January 14, 2013. ↑ "Ravens vs. 49ers – Game Recap – February 3, 2013 – ESPN". ESPN.com. Retrieved August 30, 2016. ↑ "Colin Kaepernick Salary cap and Contract page". Over the Cap. Retrieved August 5, 2014. ↑ Barrows, Matt (October 9, 2014). "Colin Kaepernick's fine-canceling headphones". The Sacramento Bee. Retrieved October 9, 2014. ↑ Wesseling, Chris (November 2, 2015). "Niners bench Colin Kaepernick; Blaine Gabbert to start". NFL.com. Retrieved January 4, 2016. ↑ Inman, Cam (November 21, 2015). "49ers' Colin Kaepernick done for season because of shoulder injury". San Jose Mercury News. ↑ "49ers hire Chip Kelly as next head coach: 5 things to know". Retrieved August 30, 2016. ↑ Brady, James (February 26, 2016). "Kaepernick's request doesn't mean he won't stay". Niners Nation. Retrieved August 30, 2016. ↑ "Hard to see how Colin Kaepernick can overtake Blaine Gabbert now". Retrieved August 30, 2016. ↑ "Kaepernick makes roster; Gabbert named starting QB". Retrieved September 8, 2016. 1 2 Wyche, Steve (August 27, 2016). "Colin Kaepernick explains why he sat during national anthem". NFL.com. Retrieved August 27, 2016. ↑ Fucillo, David (August 27, 2016). "NFL issues statement on Colin Kaepernick not standing during National Anthem". Retrieved September 8, 2016. ↑ "Colin Kaepernick Takes The Field In Socks That Depict Cops As Pigs". Retrieved September 8, 2016. ↑ "Colin Kaepernick Takes Knee for National Anthem at 'Salute to the Military' Game – Breitbart". September 2, 2016. Retrieved September 8, 2016. ↑ Dator, James (August 31, 2016). "U.S. military members show support for Kaepernick". Retrieved September 8, 2016. ↑ "Kaepernick Says He'll Donate Proceeds From Top-Selling Jersey". ABC News. September 7, 2016. Retrieved September 8, 2016. ↑ Silence From Kaepernick Critics Speaks Volumes. The Huffington Post. September 21, 2016. 1 2 US: Colin Kaepernick says he has received death threats. Al Jazeera. September 22, 2016. ↑ Freeman, Mike. "Kaepernick Anger Intense in NFL Front Offices". Retrieved September 8, 2016. ↑ Bieler, Des (November 24, 2016). "Colin Kaepernick grilled by Miami Dolphins reporter over Fidel Castro shirt". Washington Post. Retrieved November 24, 2016. ↑ "Booing Miami fans revel in beating Fidel-defending Kaepernick". NY Post. November 27, 2016. Retrieved November 27, 2016. 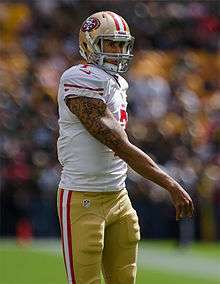 1 2 "Colin Kaepernick NFL Football Statistics – Pro-Football-Reference.com". ↑ Saracevic, Al (November 30, 2012). "Kaepernick sparks tattoo controversy". San Francisco Chronicle. Retrieved February 4, 2013. ↑ "Faith Based: Former Nevada standout speaks at local church about life, athletics". Archived from the original on January 16, 2013. 1 2 "Super Bowl 2013: Colin Kaepernick's tattoos more than skin deep". ↑ Sessler, Marc (December 17, 2012). "Colin Kaepernick foretold future in fourth-grade letter". National Football League. Retrieved December 17, 2012. ↑ "Kaepernick social media posts laud Black Lives Matter, Black Panthers since dating activist DJ". Fox News. August 30, 2016. Retrieved September 21, 2016. ↑ "49ers quarterback Colin Kaepernick and MTV's Nessa go public with relationship". San Jose Mercury News. Bay Area News Group. February 17, 2016. Retrieved September 1, 2016. ↑ Maiocco, Matt (August 30, 2016). "Kaepernick: Weight loss not due to vegan diet". CSN Bay Area. Retrieved September 28, 2016.